Even on a team full of superstars, the 23-year-old point guard has quickly risen to the status of indispensable. But he still has a lot of growing up to do. Now that the Celtics have put their faith in him with a new contract extension, can he emerge as the player they need him to be? All great athletes create a permanence within themselves. So much else is out of their control. From the time they show promise, they are judged from afar, their future writ in scribbles on some distant clipboard. What other people think of them can be more important than what they know about themselves. Their professional lives can depend on the whim of a coach or the thin, fragile strands of the ligaments in the human knee. What is often decried as selfishness or stubbornness in an athlete is nothing more than an attempt to assert something solid at the heart of a world they cannot control. They create the permanence in their lives within themselves -- their game, their talent -- as a hedge against the gleaming evanescence of the careers those talents have brought. And, of all our sports, basketball is the least permanent. People who are old enough to remember the first National Basketball Association championship won by the Boston Celtics, in 1957, also are old enough to remember that the team’s point guard, Bob Cousy, was regularly derided as a “showboat” because he had the audacity to dribble the ball behind his back. Today, given the strength and speed of modern NBA players, someone like, say, Rajon Rondo -- who plays the same position for the Celtics that Cousy did -- cannot function as an NBA point guard without being able to do that. Someone who dribbles behind his back doesn’t even draw a gasp from the crowd anymore. It took less than 40 years for the NBA to get from the two-handed set shot to Michael Jordan. By contrast, it took baseball nearly a century just to develop the relief pitcher. Even basketball’s fundamentals are not fundamental. They evolve. It is harder for basketball players to create that permanence within themselves, so when they do, they hold tight to it against an accelerated existence. It’s mid-October, and Rajon Rondo was still negotiating his future with the team. “This is a business,” Rondo explains, his eyes flickering over the shoulder of the person to whom he’s talking, taking in everything going on as his teammates shoot free throws and crack wise with one another out on the court beyond. There is a shrewdness in the compass of his gaze, and a kind of universal comprehension. And he measures every word, every thought by the syllable. He reveals very little, but he misses nothing. By most standards, these shouldn’t have been matters of any concern to him. Rondo is 23 and starting his fourth year with the Celtics. Since battling his way into the starting lineup as point guard -- the player responsible for controlling the offense that must flow through Garnett, Allen, and Paul Pierce, the team’s three stars -- Rondo has developed into a recognized force in the NBA. During the 2007-08 championship season, he blossomed most fully in the playoffs; in the deciding sixth game against the Lakers, Rondo was clearly the best player on the floor, with 21 points, seven rebounds, eight assists, and six steals. That continued through last season, when he almost single-handedly got the Celtics through a surprisingly tough opening-round series against the Chicago Bulls and became the only Celtic besides Larry Bird to put up three triple-doubles -- points, rebounds, and assists -- in the same post-season. He has the big house in Lincoln and the baby daughter. He is settled, it seems, at first glance. And throughout, he has become unquestionably the most vividly athletic player on the team. Garnett is an emotional cyclone and Allen has his spun-gold jump shot. Pierce has a dozen ways to score he hasn’t tried yet. But it is Rondo who brings people out of their seats. Defensively, he appears to be possessed of the same kind of athletic clairvoyance -- in reality, a kind of hyperattuned anticipation -- that Bird once had on offense. There were plays in which Bird would throw a pass, and the lane that he saw instantly was visible to the casual viewer only in the slow-motion replays. Flashing for an interception, Rondo can be just as sudden and startling. With Garnett, Allen, and Pierce all over 30, Rondo would seem to be perfectly positioned to be the unchallenged star of whatever is the next iteration of the Boston Celtics. He began training camp this fall in the last year of a rookie contract that would have paid him $2.09 million this year. On October 27, Rondo’s agent announced that the Celtics and Rondo could not reach an agreement to extend his contract with the team. It appeared that Rondo would be a restricted free agent at the end of this season. However, on November 1, the two sides agreed on a five-year extension that will pay Rondo the $55 million he was asking for in the first place. For a month, Rondo seemed to be in a preposterous position -- a young man who is absolutely vital to a team’s success, yet about whom the team seemed to have had amorphous, long-term doubts. The roundelay about his future began in June, after the Celtics were eliminated from the playoffs by the Orlando Magic. There were rumors that Rondo had arrived late for a playoff game and that he’d had something of a chronic tardiness problem throughout the season. (Enterprising souls then dredged up difficulties Rondo had playing for Tubby Smith at the University of Kentucky.) Celtics general manager Danny Ainge took the unusual step of confirming the rumors. He went on the radio and said that Rondo had to grow up. Rondo’s agent fired back at Ainge, who also had said that Rondo was “a player we want to have on our team.” This is, of course, a very interesting statement. It has a loophole in the middle of it through which you can drive a luxury automobile. To New Jersey, say. Or Memphis. In the end, there was no trade, and he is still in Boston. He won. It looks very much like the place he belongs. It is one of the first practices of the year, and someone drains a long jump shot to win for Rondo’s team, and the guard goes bouncing around to all his teammates, dropping his head on their shoulders and laughing at everyone on the other team. “Rondo’s fine,” Doc Rivers says during that mid-October practice, as the point guard ducks down the hallway, trying to avoid paying the coach what he owes on a truly terrible college football bet. (Rondo took Kentucky. Rivers took Florida. Kentucky should give Rondo an Alumnus of the Year Award for that kind of loyalty.) “Unfortunately for Rondo, he’s on a high-profile basketball team. The reason we lose is never going to be Kevin, or Paul, or Ray. Who’s the next guy? Rondo,” Rivers says. “Unfortunately, it seems that people look two ways at him -- the reason that the Celtics win is because of the way that Rajon Rondo plays, and the reason that the Celtics lose is because of the way Rajon Rondo plays. He has to answer to both of those all the time, and that’s a bind, because there’s no way around that. Truth be told, the reason we win is because the Big Three play like the Big Three. “But it goes to that fourth guy because he’s who everybody targets, even the opposing team. Like Orlando, in the playoffs last year. They said, ‘We’re going to make him beat us.’ He’ll get that this year, too, and each year he’s handled that better. Rivers was frustrated when the trade rumors leaked in June, not least because they threatened the special relationship he’d been building with his point guard. In 1983, as a rookie point guard with the Atlanta Hawks, Rivers struggled to please coach Mike Fratello, a martinet who since has gone on to a career as a broadcaster. “I remember feeling picked on,” Rivers recalls. “Fratello used words toward me that I’d never heard before. What you realize is that I’m that important. If I can take it, everybody can take it. I probably am tough on point guards because I am one. That’s only one of the relationships, however, albeit a vital one, in the life that Rajon Rondo is living today. There is also the one he has with the business institution that is the Boston Celtics. There is also the one he has with his own history, throughout which he has clung fiercely (arguably, too fiercely) to the permanence that he has built within himself -- through his game, his talent -- as his life sped up around him. Bibby came from a basketball family. His uncle Henry Bibby was an NBA point guard and the coach at the University of Southern California. His cousin Mike Bibby was a first-team All-American at Arizona and currently plays the point for the Atlanta Hawks. Also, at the University of Richmond, Bibby’s father coached Kevin Eastman, who is currently a Celtics assistant coach, and another cousin is married to Eddie House, who backs up Rondo at the point in Boston. “Rajon was real thin, but he was wiry strong,” recalls Bibby, who brought Rondo to Eastern to play. In one week of informal summer pickup games, Rondo absorbed Bibby’s entire system, but he bristled at criticism, and Bibby had to suspend him a couple of times. Nevertheless, Oak Hill’s reputation as a finishing school for basketball players guaranteed that college coaches found out how to get there. The first time that Rondo played a pickup game, there were 30 coaches in the gym, most of them looking at Josh Smith, a vastly talented forward who’d already made it clear he was going to forgo college and move right into the NBA draft. (Smith now plays for the Atlanta Hawks.) For his part, Rondo managed to turn heads mostly through his speed and toughness, and his defensive ability. “When he came to us,” recalls Steve Smith, the longtime coach at Oak Hill, “he was probably borderline Top 100. After about a month, I thought, ‘This guy’s really good.’ He had those huge hands and that long wingspan.” During that season, Smith took Oak Hill to Barcelona to play against some Spanish teams. In one game, with Josh Smith in foul trouble, Rondo put up 55 points, many of them against Sergio Rodriguez, a Spanish star who now plays for Portland in the NBA. 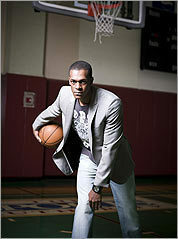 In 2004, Rondo was recruited by the University of Kentucky, and he played two seasons there, chafing under the patterned offensive system favored by then-coach Tubby Smith. Rondo wanted to run, and Smith didn’t want him to, and the two clashed regularly, with Smith benching Rondo for six games. It was here that Rondo’s reputation for stubbornness, and for uncoachability, was born, even as he led the Southeastern Conference in assists as a sophomore. (Now at the University of Minnesota, Smith declined to return phone calls for this story.) When Rondo decided to declare for the 2006 NBA draft, more than a few people at Kentucky were not sad to see him leave. “At Kentucky, we ran a system,” Rondo says today, measuring his words by the syllable. “All five guys touch the ball and we pound it in to the bigs. My style is that it’s better for me to get out on the break and get it to my teammates.” That was what Danny Ainge saw in Rondo that prompted him to trade for his rights after the 2006 NBA draft. “I saw an instinctiveness that you can’t teach,” Ainge says. Rondo joined a Celtics team that was something of a mess. He was one of three point guards on a team that went a dismal 24-58. He was stubborn. He was impatient. He bridled somewhat at criticism from Rivers and at what he saw as his limited playing time. However, in the off-season, things happened. Ray Allen came to town. Then the Celtics traded what seemed like half their roster for Kevin Garnett. Rondo was not part of the deal. The championship followed that spring, and Rondo, playing with more and more confidence as the season went along, began to make his individual mark around the league. (Steve Nash, the star point guard for Phoenix, was particularly extravagant in his praise of Rondo, with whom he shares an agent.) By the beginning of last season, Rondo had established himself as a genuine NBA star, albeit still a work in progress. Then the trade rumors started again. And the loopholes yawned wide yet again, whether in the latticework passive voice describing Rondo’s tardiness last year, or in the phrase “we expect” to have him here for a decade. Absent the deal struck at the beginning of the month, Rondo’s future with the Celtics could not have helped but be a point of contention as this season progressed. When negotiations on the extension initially fell apart, it meant not only that Rondo would have joined the ludicrously talented free agent field of 2010 -- which includes LeBron James of Cleveland and Dwyane Wade of Miami -- but also that he would have had to play extraordinarily well for a team that might not have wanted to keep him if he wanted to get paid like the rest of that class. Now, even though he has his new deal, he will play for the team by playing for himself. He’s stubborn that way. He’s still the future of a team with a considerable past that, as William Faulkner once said, is not even past. It’s still there as Garnett rouses the crowd or Allen drains a jump shot or Pierce battles his way to the basket. And on the perimeter, eyes moving, missing nothing, Rajon Rondo looks to pick something off for himself -- the ball, a moment, a career. That’s what’s permanent with him -- motion, constant and perpetual. Charles P. Pierce is a staff writer for the Globe Magazine and can be heard on NPR's "Wait Wait...Don't Tell Me!" and "Only A Game." E-mail him at cpierce@globe.com.